Side-loading is like uploading except that you’re loading a photo from the Internet (sideways from dotphoto) instead ofÂ uploadingÂ to dotphoto from your computer. How can I side-load to dotphoto? Copy the Internet addressof the image you want to side-load. 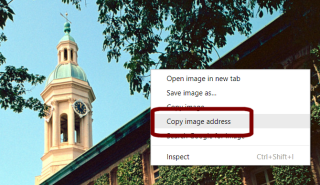 Paste the addressÂ into the address line of the dotphoto upload tool. Tap the greenÂ Start UploadÂ button. Click here for an illustrated procedure.